Former Everton and Wales captain Kevin Ratcliffe believes Ole Gunnar Solskjaer was the wrong choice when he replaced Malky Mackay as Cardiff City manager. But after Cardiff's relegation, Ratcliffe says the Norwegian deserves a chance in the Championship next season. "Maybe they would have been better off employing a manager who knew the Premiership," he said. "But you've got to give the man a chance for next year, it's no good chopping and changing managers." Cardiff's 3-0 defeat at Newcastle saw them relegated after one season in the Premier League. Former Manchester United striker Solskjaer was appointed manager in January following Mackay's sacking. He had previously been in charge of Molde, guiding them to victory in the Norwegian Cup in 2013. But Solskjaer arrived at Cardiff with the Bluebirds in disarray. They were already close to the relegation zone after a run of poor performances and a well-publicised breakdown in relationships between owner Vincent Tan and Mackay. The 59-times-capped Ratcliffe, who played for Cardiff in the 1992-93 season, believes the club needed a different type of manager to the largely-untested Solskjaer. "They needed someone knew what was needed to get them out of the pickle they were in, and if you look at the credentials Ole's CV didn't match that," he said. "I thought it was very difficult for him when he came in to actually learn and show if he had the credentials. "It was a big ask ... an important time for any club and one that maybe he wasn't prepared for. "But that's easy in hindsight. Now Cardiff have got to get back into the Premier League and hopefully lessons have been learned." And Ratcliffe says Solskjaer should retain the job next season. "You've got to give the man a chance for next year," he added. Solskjaer said he "definitely" wants to stay on as boss and feels the Bluebirds will soon be back in the top flight. 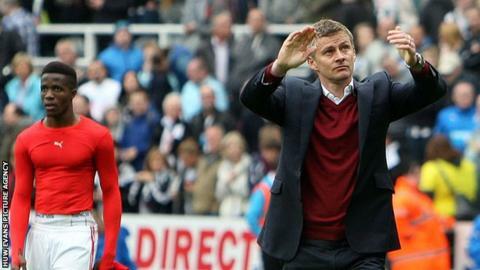 "Before this year we had four seasons at the top of the Championship," Solskjaer said. "Now we have gone down and taken a step back, next season will be about showing character and bouncing straight back." The Norwegian, who has picked up only 12 points from 17 league matches since his appointment in January, says he is confident Tan will stick with him. "I have a contract," Solskjaer added. "We have had meetings. Of course I am just planning for the next game right now, and then I will be planning forward." Ratcliffe believes the fact that Solskjaer was the choice of Tan will work in his favour. "Solskjaer is his choice - you've got to remember that Malky [Mackay] wasn't. "But I think Ole deserves a chance in the Championship to prove that he can be a top quality manager." Ratcliffe fears Cardiff are likely to lose some players in the close season, with midfielder Gary Medel in particular likely to be a transfer target. The Chile international is expected to captain his country at the World Cup in Brazil this summer.